Last August, Olaf Malver led the first-ever exploratory commercial kayaking expedition into the Skjoldungen Fjords of southeast Greenland, in pursuit of legendary Arctic explorer Fritjof Nansen’s route 125 years earlier. Here is his first-hand account! On the starboard side of my small kayak, a huge tongue of glacier pouring down from the Greenland Ice Cap was nearly touching the Arctic Ocean. And straight aft of my rudder was the characteristic pointy profile of Kiviat Mountain – looking just like the black & white photograph in the old expedition description. But where was the cairn? 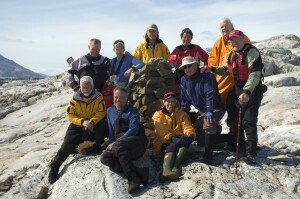 The absolute need to locate that cairn had brought a small band of explorers together at this most remote of spots on Greenland’s southeast coast. We had sailed several days south from Tasiilaq, the last human settlement that lay 200 miles northward, then ventured into Umivik Bay in search of Fritjof Nansen’s cairn. This place was the starting point from which in 1888 Nansen and five others made the first successful crossing of the second-largest ice mass on Earth after Antarctica. 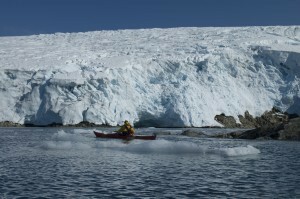 We were thrilled to be the first commercial adventure travel group ever to venture into this hard-to-reach area on Greenland’s eastern shores–an achievement made possible after several days of sailing and paddling through brash ice and remote South Greenland seas, and then exploring the inner coastal areas using small sea kayaks. And we would be even more thrilled if we could spot the cairn. I had a particular personal interest in finding this spot. Nansen’s second-in-command, Otto C. Sverdrup, was my great-great-uncle on the Norwegian side of the family, and he later became one of the most famous ice navigators and explorers in the Arctic. I wanted step in my ancestor’s footstep and feel this place, imagining how it must have been for him. I needed to understand the odds that these first explorers faced, what difficult decisions they had to make every day, and the hardships they went through to survive. In other words – what drove them and how did they succeed? Only by understanding that would I learn what great explorers like them were made of. And perhaps I could learn from something from their sufferings, courage and curiosity. “It’s right there – up on the cliff! “ ‑- my British paddling partner Debbie erupted with excitement. Sure enough, 200 feet above us a 5-foot-high brown, slightly crumbled cairn had been erected. We had heard from local Inuit hunters who come here that it was located somewhere on the beaches of enormous Umivik Bay. We had found it by comparing it with the pictures in the exploration annals from Nansen’s trip – the characteristic Kiviat Mountain profile was the clue to our discovery. We paddled quickly to shore, landing on the hidden beach where Nansen and his men had dragged their two row boats to land. These men had just endured a grueling 200-mile rowing struggle north from where the ice had released them from its vice grip. On this exact small pebble beach on the 11th of August 1888, the four Norwegians and two Lapps had celebrated, knowing this place could be the key entry point via which to reach the crest of the Greenland Ice Cap. Surveying the glaciers above, it certainly looked like there were a few major crevasse fields that could have hindered their dogged ambition to cross the Ice Cap. I imagined that when they stood here, they were elated yet their minds were focused on what lay ahead. It was late in the season, and they had only scant supplies left. There was only one way to go – onward – across the unknown mass of ice. They could not return northward by sea to Tasiilaq due to the risk of being caught in the sea ice for weeks, and there were no hunting possibilities once they got onto the ice. Nobody knew at that time the extent of the crevasses that might lie ahead — what they did know was that their only chance for survival was to ski quickly west over 220 miles of unknown ice fields to Godthaab on the west coast of Greenland. 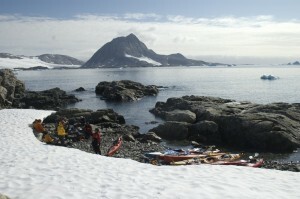 So our group of kayakers – 10 in all — stepped ashore the same place Nansen had landed and tied our boats together. We even had a celebratory bite of chocolate – well occasioned, given that we were in the true footsteps of great explorers! Our group then eagerly scrambled up vertical rocks and a small snowfield to finally reach the small cairn. I was the first to arrive at the spot and stood there in awe and silence. The importance of this place in the context of polar history is simply amazing, and I felt so excited to be part of it! The rest of the group caught up, and we took a group photo by the cairn as I shared the saga and feats of Nansen and his men with my clients. The original explorers did manage to reach Greenland’s west coast alive after six weeks of skiing over the expanse of ice through blinding whiteout conditions. Once they arrived, Nansen and Sverdrup built a leaky make-shift dinghy out of canvas and Arctic alder branches, just in time for them to row to all the way to Godthaab and send for a rescue party to retrieve the other four who were waiting back at western rim of the Ice Cap. But it was too late to take the last ship home to Europe– King Winter had just arrived as the hardy crew all returned to civilization. Their feat was amazing – but very few have heard about it. Perhaps because there was no death or drama involved – just simple hard, professional expedition work, courage and determination. And perhaps because these men were not driven by fame and self promotion – they just wanted to know what lay within the Ice Cap and whether they could achieve the feat they set out in pursuit of. They had that “need-to-know-attitude” – the exact same reason we were there. Nansen, who was the driver and instigator of the expedition, was deeply curious, a successful scientist at heart, and always driven by a desire for deeper understandings. He has always been one of my explorer heroes. Later he even achieved acclaim on a large humanitarian scale, supporting the League of Nations rescue efforts of Armenian survivors from the Armenian Holocaust in Turkey (for which he later received the Nobel Peace Prize). So, at this little brown cairn, the greatest of explorers and humanists in modern history had passed, along with his co-explorers, including my great-great Uncle. Their memory was framed by one of the wildest tracts of wilderness on the planet – East Greenland, where the many huge glaciers dwarfed us and hundreds of magnificent unnamed peaks witnessed these great unheralded explorers, and now silently and majestically observed us—125 years later. We let out a”Hip-Hip-Hurrah!” three times, as we realized we were in a small but amazing way also a part of history. Thanks for the wonderful piece you wrote. Ken and I enjoyed the trip so very much. That part I’m not sure you believe as we did not paddle 2 days and hike as you did. But I’ll tell you now about our side. First of all, this was a group of very strong paddlers and as a result we were most often at the end and that’s not a good feeling especially since it was established that we would paddle close together (as in the past). We were there to see Greenland not just to paddle fast. We missed the group pauses where we would swap snacks and pass cameras around for photos and laugh at something the group had just experienced together. The group, the captains, the boat, and you were terrific. Really. But Ken and I had a number of wonderful experiences that we didn’t have the chance to share. While we were hiking on one of these off days, we met two Danish geologists working in the field until mid October. Their manner and interesting work was an unexpected happening and so personal. Next, we had quite a long, interesting meeting with the director of the museum in Tasilaaq. Although we felt his negativity, we learned quite a lot about the town, its people, more history than we would have otherwise have access to and a personal tour. Yes, we even left a message for Robert Peroni walking up there to reconnect. Although he was not available, I was fascinated by his expansion and his astounding collection of artifacts. This was a delight to my eyes, mind and heart since I have surrounded myself with Inuit culture since age 15. And then there was the “spiritual” or “virtual” meeting in the Tasilaaq church upon seeing the portrait of Ulrik M. whom I always referred to as the Rennaisance Inuit. Even though we had no further connection after meeting him, we felt a real closeness to this special man and suddenly, there he was! Marblehead where she has been(! ), we would have become friends, for sure. We have learned so much about piteraqs, existing in a culture quite alien to ours, the future of her students and what has become important to her now. Perhaps another trip is in store – in winter, she says. Two days after our arrival home, an acquaintance was drowned off the coast of Labrador in his craft, when a rogue wave washed him overboard as he was returning to Boston after spending the summer sailing the north Atlantic journeying from Svalbard (?) and Greenland. A storm was raging and he came up from below to relieve his helmsman. He was not yet tethered and both went into the sea. The third man was below. The helmsman was washed back on board but Ned Cabot could not be rescued as the steering chain broke. His body was found the next day by the RCMP in his vest. He was a member of our travellers club and the son in law of Brad Washburn; truly a family of adventure. (More info is online.) Do you remember you asked what we expected of the trip and I responded “Safety for all”. Remember my last comment to you (written an hour before we learned of his death on September 1st): “… and I opted for safety and safety is was I got.” I looked at Ken and said, “There for the grace of God go I.” His death has had a lasting effect on us. And one more: I thought of this trip as another kayaking adventure completely unaware of the new one I was to encounter: sailing in open waters! Ken is a sailor and my brothers are heavy into the sport but I had no interest but loved it after all! So you see, dear Olaf, what this journey and the others beforehand has meant and how it has affected the two of us. Let it continue. Isn’t that what travel is all about?